Seeing God's Fingerprints in life.. Yes, trust is the key and often so difficult to maintain. I’ve been there and experienced both faith, trust and disappointment in maintaining that positive attitude. The Lord constantly reminds us “Fear Not” … anyway, He constantly reminds me of this since it has to be the biggest obstacle in my faith based life. Even though I can go back through my journals and actually SEE how He has always provided, always been faithful- financially, spiritually and in the answers to the prayers of my heart. 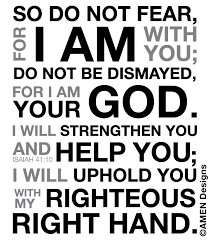 Isaiah 41:10 just one of many reminders. Th ank you for posting your sweet story. Keep enjoying His love, basking in it and enjoying your kids while they are still young and at home. Time seems to fly as they mature.